Invitations: We made ours with blank, white cards. The front of the card read Winter in August with the letters looking like they had snow on them, the ’g’ in August looked like a melted snowman, sticker snowflakes, and a bright sun in the corner. When you opened the card the top had a girl ’throwing’ a 3-D snowball (made by an accordion fold and a small cotton ball glued on top). The bottom had all the details of where, when, etc. with more snow/winter themed stickers, etc. We used wording like ‘Brrrrithday Party’ and ‘Our Igloo’. Then when we mailed the invites, the post office was selling penguin stamps, so we were happy to use them! We also added snowman stickers to the envelope. Then, when they entered the house we had hanging snowflake chains in the doorway & white flowers in blue water with clear, plastic diamonds (these were found at Party City) that looked like ice on the bottom. Throughout the house, we had decorative peel-offs on the floor. There were snowflakes & one that looked like a melted snowman- the kids loved that one. We also hung the foil snowflake chains in the hall to the bathroom. The bathroom was decorated with all the snowman that we normally use in winter - free decorations! Also, we filled the bathtub up with water, floated a black, plastic magician’s hat on top, put a carrot and a couple of black, plastic diamonds in the water and instant melted snowman! The dining room was decorated with the themed food (see below) and some hanging, white paper fold out fans that looked like snowflakes. The table was covered with the winter-themed wrapping paper. Then, as the guests stepped outside, there were 3 large, round, white paper lanterns that we made into snowman faces and a penguin. We did this by taping on cutout pieces of construction paper. They turned out super cute. We also had balloons & streamers throughout the backyard. Activities/Games: As the kids arrived, we had a table set up (also decorated with silver winter themed wrapping paper) in the backyard with black magic snowflakes (the kind you scratch off the black to reveal a design underneath) and plastic balls for them to blow up. Both were from O.T. C. The balls had a blow-up snowman inside, so the kids had to blow the snowman & the ball up. 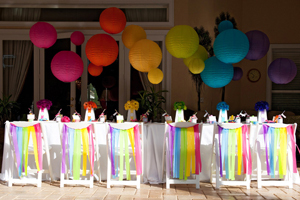 These activities kept everyone busy until all the guests arrived. Next, we had lunch (see below). After all the kids were fed, we played Pin the Nose on the Snowman. I gathered the kids in the living room and we used the decorated door (mentioned above) to pin the carrot nose on the snowman. I used a winter scarf as the blindfold. This game, in whatever version, is always a big hit. After that, I walked the kids outside where my husband was waiting with a big surprise! As we walked out on the roof-covered porch & into the yard, he was waiting on the roof with a HUGE bag of packing peanuts and made it SNOW on the kids! The kids absolutely LOVED this! They were tossing it at each other, laying down making snow angels and having a ball. Yes, it was a mess, but I left the clean up to the man who made the mess. Ha, ha! He used a shop vac, so it wasn’t too bad. The next game we played was Sun & Snowball. It basically freeze tag, where on person is the sun & the have to melt or tag the snowballs. Another big hit. We then went to the table we used earlier (it’s a long, fold up table) and played Snow Blower. The kids had to use straws to blow their snowball or ping-pong ball across the length of the table, without it going off the sides or they started over, to the other end. Very funny to watch! Next, we had sleigh rides. Here’s how that went: We have a trampoline, so some kids were playing Don’t Break the Ice (just jumping) while they were waiting as we took others around on the ‘sleigh’. We also have a golf cart & my husband attached a dolly on the back which had an old plywood sled attached to it. The plywood sled was a decoration we used in our front yard at Christmas time, but it was falling apart so he just attached one side to the dolly and bolted some old plastic chairs for the kids to sit on, so from the one side it looked like they were in a sleigh ride. We drove them around the yard & that almost ended the party. That is all the kids wanted to do! But we had more, so next up was the Polar Plunge! We filled a big, metal bucket with ice water & the kids had to stand in it for as long as they could to see if they could last up to one minute. (I didn’t want to go any longer than that.) Even some of the parents participated! At the end of the party, some of the kids were even challenging themselves to do it again. The last game we played, after we took a break for the cake, was Snowball Fight. We filled white water balloons and the kids had at it! Towards the end of the party, we let the kids just play in the yard until they left. Snowman Pizza - we ordered three pizzas, a large, medium, & a small. We cut a small, straight slice on the bottom of the small & on the top & bottom of the medium & top of large, put them together to make a snowman pizza. We placed black olives for eyes & belly ‘buttons‘, a baby carrot for the nose & the crust from the slices we made for the mouth. That turned out soooo cute. Melted Snowman Water - We filled a clear plastic water cooler, they kind with a spigot, with ice, water, a carrot & plastic black diamonds, wrapped a scarf around the bottom. We also had mac & cheese & chips, but I couldn’t think of any names for those, lol. One of my friends actually has a SnowCone machine, so we borrowed it and the kids really loved those! Especially because it was a hot day. Cake: Keeping with the winter theme, I made a mug of hot chocolate cake! I used 4 round cakes, which were, ironically, vanilla at the request of the birthday girl, covered & layered with icing and wrapped in white fondant. I used my hand to make a rim at the top of the cake using the fondant & inside the circle divot that was created, I put a layer of chocolate frosting for the hot chocolate. I rolled out a fondant handle, which I had to dry over night before getting stuck on the side of the cake using toothpicks. It was topped w/ 9 large marshmallows on top, which held the 9 candles & ‘Happy Birthday’ cut out of blue sugar paper, that conveniently covered my many fondant mistakes. I also made a bunch of chocolate microwave mug cakes in coffee mugs & topped them with white, fluffy icing to look like mugs of cocoa & whipped cream. The overall look was adorable & thankfully, not too hard to do. Favors: The favors were all from O.T.C. Each guest received a plastic mug that had a snowman design on the outside, which was filled with snowman face stickers, a pop-up polar bear toy, and stackable penguin pencils. They also took home the inflatable balls & the snowflakes they decorated at the beginning of the party. Costumes: Every year, I buy my daughter a shirt with her name & age embroidered on it including that year’s birthday theme design. This year it had snowflakes I have always found these on Etsy. A friend of mine suggested that I get a quilt made out of them & I hope to do that someday. Also, I had bought her snowman socks from O.T.C., it was too hot for them, but they will come in handy in a couple of months. I really didn’t spend a lot, the main cost being the food. Again, I was so lucky that winter stuff was on sale. I used the O.T. C., Party City, and lots of stuff we already had at the house. We were very excited about how much our friends donated. We collected lots of outgrown coats, a ton of new gloves, a bunch of new knit hats, and almost $100 to give to the Salvation Army! I can’t wait until my daughter takes the items/money to the S.A. She’s excited, too!